A woman's ability to have children depends on her ovarian reserve, which is the capacity of her ovaries to mature eggs and promptly release them. Because it often comes as a surprise to many aspiring mothers that women are born with all the eggs they will ever have, learning how ovarian reserve affects their fertility is crucial for preparing to get pregnant. Continue reading to gain a broader understanding of your ovarian reserve, its key characteristics, and how it affects your chances of becoming a mother. 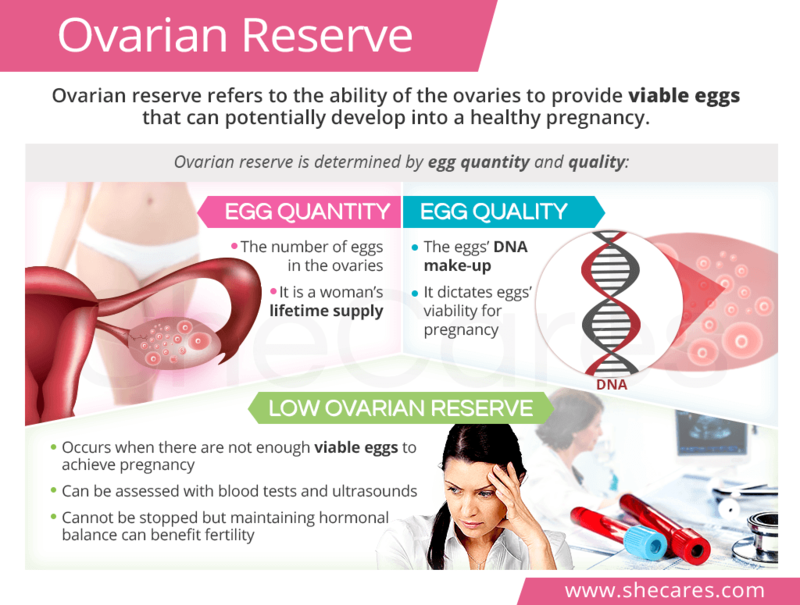 Ovarian reserve is a term used to describe the ovarian ability to provide viable oocytes (eggs) that can be used during ovulation for possible fertilization and - consequently - pregnancy. It embraces multiple processes, including eggs' requirement, maturation, and final release as well as their fertilization, implantation, and development into a healthy, full-term pregnancy. 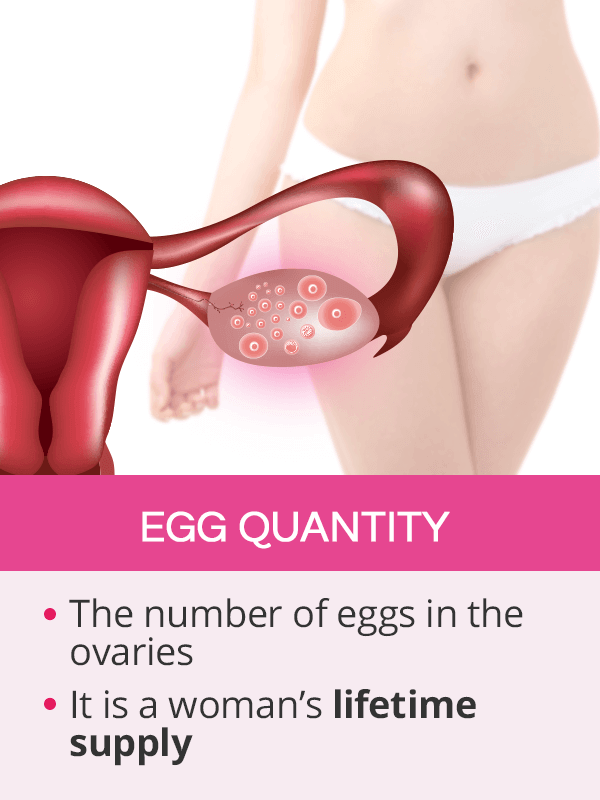 Egg quantity is the number of eggs in the ovaries. Egg quality is the chromosomal make-up of the eggs. A woman's age is the most important factor affecting ovarian reserve, although other medical conditions or treatments can speed up its decline as well. Egg quantity, or egg count, is the pool of eggs in the ovaries, which is determined by genetics. Women are born with a set number of eggs. Because they cannot be produced nor replenished, the egg count a woman is born with is her lifetime supply. Womb. Female egg production only occurs in utero. By the 20th week of pregnancy, fetal ovaries are said to contain as many as six million eggs, but most of them will degenerate before birth. Birth. There are about 1-2 million eggs in the ovaries at birth, which will continue to degenerate until puberty when proper hormonal production begins. Puberty. By the time a girl has her first period, called menarche, the number of eggs will have dropped to 350,000-500,000. Menstruation. During each menstrual cycle, ovaries will recruit several hundreds of eggs for maturation, but only one will be released on ovulation day. Unreleased eggs in a given cycle will be lost. This means that of all the eggs women were born with, only about 400-500 will be chosen for ovulation in their lifetime. Menopause. The ovarian reserve will reach a total depletion by the age of 51, on average, which marks the end of her reproductive abilities. Another important characteristic of a woman's eggs is their quality. 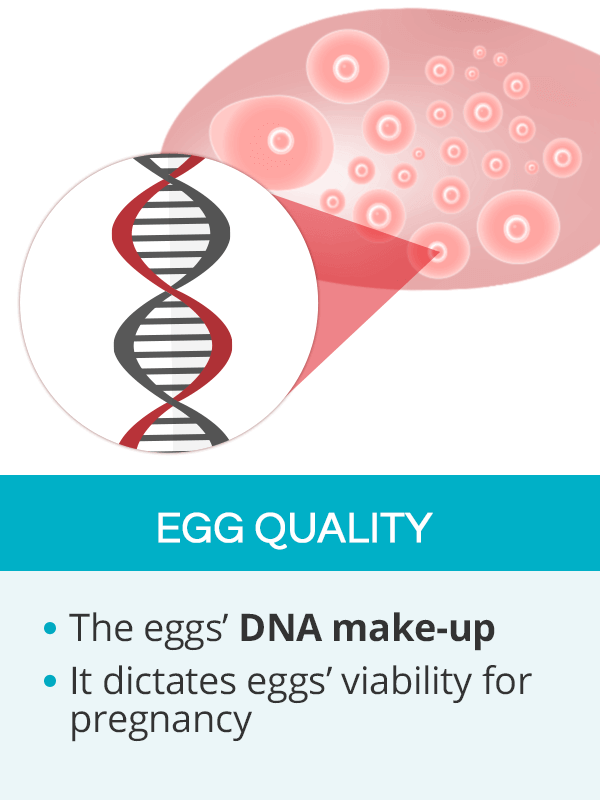 Egg quality is a term referring to the DNA composition of the oocytes. It is a strong determinant of the ability of the eggs to undergo fertilization, uterine implantation, and development into a fetus. Similarly to egg count, the aging process is what causes poor egg quality. Throughout a lifetime, certain factors, such as illnesses, high fevers, or toxin exposure, lead to chromosomal abnormalities within the eggs, rendering them unviable. Younger women with normal egg counts also have sporadic degenerative changes in their eggs. However, because their egg pool is high, these abnormal eggs do not affect their fertility. Women 35 and older, on the other hand, have a higher percentage of abnormal eggs as well as a naturally diminished egg count, which significantly decreases their fertility. 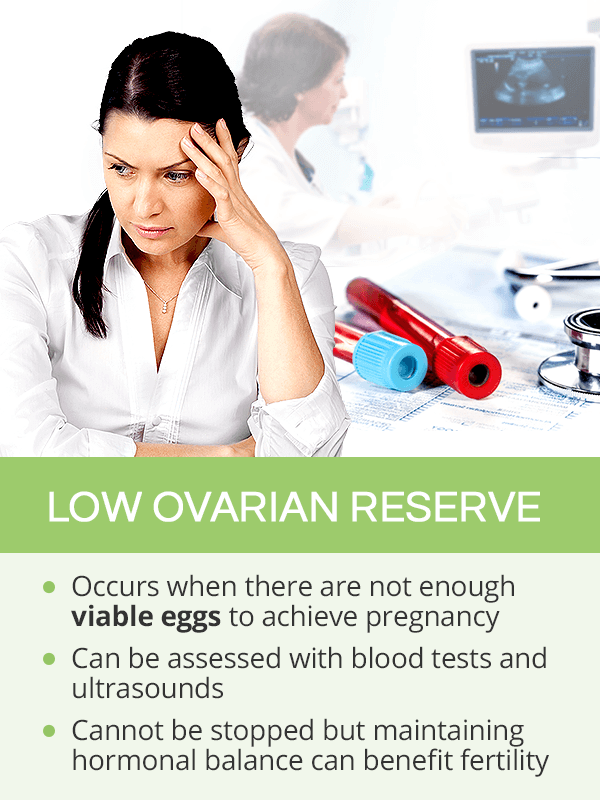 A low ovarian reserve occurs when there is an insufficient number (low egg count) of viable eggs (poor egg quality) in the ovaries to achieve pregnancy. The speed of ovarian reserve decline is individual and varies from woman to woman. However, its progression typically accelerates 10-15 years before menopause. This is why fertility at 35 and older might be compromised for some women. Other factors can also contribute to ovulatory abnormalities and speed up the decline in ovarian reserve. They include premature ovarian failure, premature ovarian aging, chemo- or radiotherapy, and more. Why is Low Ovarian Reserve Important? Low egg reserve matters the most for women who want to get pregnant. As said earlier, only one egg is released per menstrual cycle. If that egg has chromosomal abnormalities, it may fail to be fertilized or implanted in the uterine wall. If it does proceed past implantation, these degenerative changes in the DNA might lead to miscarriages or genetic disorders in the fetus. Low ovarian reserve can also decrease the success rates of in vitro fertilization (IVF). While there are no egg quality tests available to date, a variety of diagnostics tests can be used to estimate their quantity. They only provide an estimate because the exact number is impossible to be determined. Anti-Müllerian Hormones (AMH). AMH is the preferred test for diagnosing low ovarian reserve. AMH is a protein hormone that is produced by ovarian follicles as they develop. Normal AMH range between 1.0 - 4.0 ng/mL. Low egg count is indicated by results lower than 1.0 ng/mL. Day 3 FSH. The levels of follicle-stimulating hormone on the 3rd day of the cycle should be low, between 5-9 mlU/mL. FSH results of 13 mlU/mL and above indicate diminished ovarian reserve. Estradiol. This form of estrogen should be high in the first part of the cycle as it is produced by maturing follicles. Levels below 40 pg/mL signal low ovarian reserve. Antral Follicle Count. This test evaluates the number of follicles in the ovaries, in which eggs mature. Although a few hundred are selected each cycle, only a small portion grows to be visible on an ultrasound. There should be 10-20 follicles. Less than 8 follicles signifies low ovarian reserve. A woman is advised to undergo fertility tests if she has been trying to conceive for 12 months, or 6 months if she is over 35 years old. Cancer patients might also undergo testing as a form of an evaluation for fertility preservation. The age-related decline in the number and quality of eggs cannot be stopped nor improved. Following a fertility diet to improve egg quality can help prevent hormonal and nutritional deficits, thus promoting healthy menstruation and ovulation. Along with moderate fertility exercise, a diet can help achieve a normal weight and reduce the negative effect of an abnormal body mass index (BMI) on egg quality and fertility. A nutritious diet should be balanced with key macronutrients, namely complex carbohydrates, healthy fats, and lean protein, preferably plant based. A woman should also opt for ovulation-friendly full-fat dairy and phytoestrogenic foods, such as flax seed, lentils, or broccoli, to support hormonal equilibrium. Phytoestrogenic supplements, such as black cohosh or red clover, provide the body with plant-based estrogens found to alleviate hormonal imbalance, thus improving the maturation and release of eggs. Hormone-balancing supplements, such as Macafem, stimulate the endocrine glands to jump-start their own hormonal production, ensuring healthy egg maturation and release. Other supplements shown beneficial for good egg quality and ovarian function include coenzyme Q10, fish oil, and melatonin. Ovarian reserve is what a woman's fertility is all about. There are two components to ovarian reserve, namely an egg quantity, which is simply the number of eggs a woman is born with, and egg quality, which comprises of the ability of the ovaries to mature those eggs so that they can develop into a healthy pregnancy, if fertilized. As a woman ages, her ovarian reserve naturally declines, reaching complete depletion with menopause. Although the age-triggered low egg count or poor egg quality cannot be prevented, keeping proper hormonal balance with a fertility diet and herbal supplements, such as Macafem, can be beneficial to maintaining a ripe fertility. Fett, Rebecca. (2014). It Starts with the Egg. New York, NY: Franklin Fox Publishing.